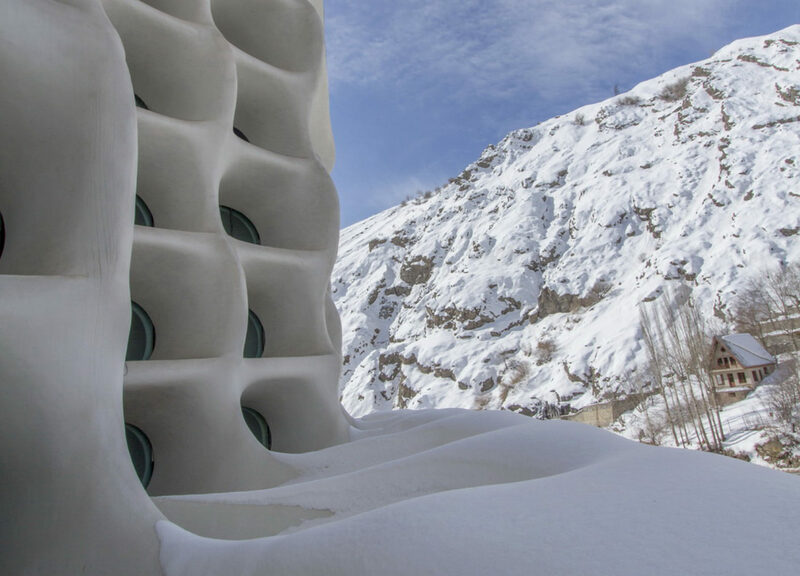 The hotel is located just outside the resort, on the mostly snow-covered slopes of the Alborz Mountains. Even in Iran a few people go skiing. 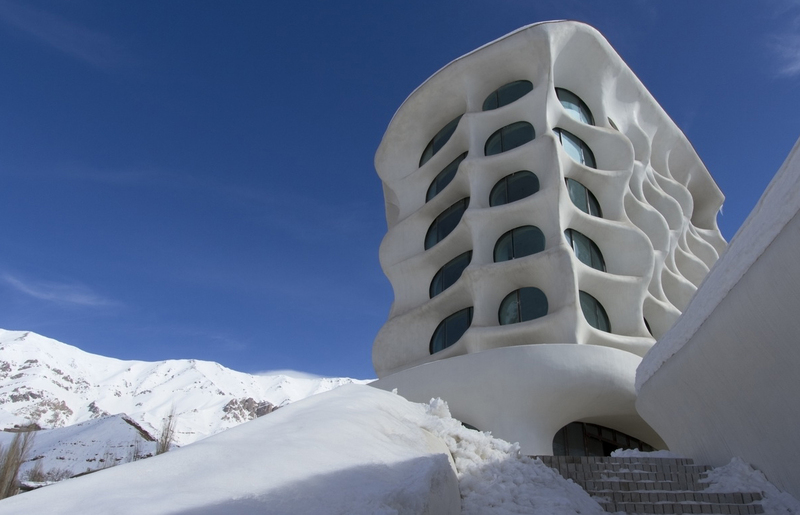 A popular choice is Shemshak: the country’s second-largest skiing resort has been open since 1958, and lies north of Teheran. Ryra Studio designed a hotel there that recalls a mogul piste. Yes, it’s true: Skiing, snow and winter are definitely not the first words that spring to mind when you think of Iran – even though the country has mountains that are higher than every Alpine peak. The mostly snow-covered tops of the Alborz Mountains can be seen towering in the distance from the capital city of Teheran. And it is there, less than 60 km from the capital, that you find the village of Shemshak at an altitude of 2,500 to 3,000 meters above sea level. People have been skiing in this area since 1958, and even though it offers little more than two large chairlifts and several smaller skiing facilities it is nevertheless Iran’s second-largest winter sport resort. The skiing area is even considered to be Iran’s most demanding, with several steep slopes and mogul pistes. The soft, white shapes are reminiscent of bones or the mogul pistes and nearby ski slopes. The ten-story hotel located on a mountain slope a few kilometers from the resort looks not unlike a mogul piste itself. The brief for the architects from Ryra Studio in Teheran was to create a “cool” hotel for young people. Though the investor had already had a concrete base built for an earlier design, Ryra Studio architects felt the cubic shape of this base would jar with the mountain slopes, and wanted instead to employ a softer, more organic formal language for the hotel. The organic shapes are continued inside. The hotel was intended to explicitly attract young skiers. 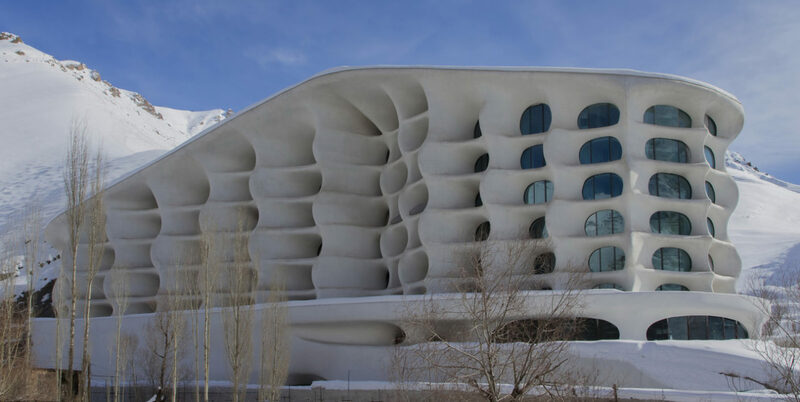 Thanks to the gentle, white curves now characterizing the building’s facade it virtually merges with the snow-covered landscape in winter. Inside, however there are warm rooms, whose round walls are reminiscent of igloos or natural caves, and whose rounded windows and balconies afford stunning views of the surrounding landscape. There are 67 apartments in all, varying from a 45 m² studio to a spacious 270 m² penthouse with a roof terrace. Each of them is different, but all are designed as “cozy caves” in which guests “can relax after a long day out in the cold,” according to the architects. So who knows, the next skiing hotspot might one day be in Iran.